There is not a more difficult surface to keep refreshed and new looking than a horizontal deck surface. It takes the use of high quality coatings and stains along with regular maintainence to keep your decking in tip-top shape. We have 13 years of experience staining exterior siding, decks, doors and furniture. We always consult with every client on the varying issues exterior woods can cause. Staining and finishing new wood is obviously the best way to finish correctly and allow for years of brilliance. Using a high quality stain and sealer designed for decks will work better than a general exterior stain. Previously finished exterior wood MUST be prepared correctly in order to get a new look. Preperation – Cleaning the wood with a TSP solution or a manufactured wood cleaner and brightener is always the first step in preparing old wood. Pressure washing the solution and removing the dusted and flaking previous coat is also essential. Once the decking is clean and washed allow for the wood to dry. Cedar and Pine. A large majority of deck wood is composed of these species. Both woods are cost effective to build with and can be finished to a quality appearance. These softer woods will fade and change color with UV, water and mildew. Keeping a coat of sealer and stain on the surfaces every year or two will keep the finish looking nice. Exotics – Mahagony, Teak and Ipe. We see a fair amount of decks built with these hardwoods in the mountain regions. Decks take a beating in the high country and these species of wood can withstand the elements like no other. 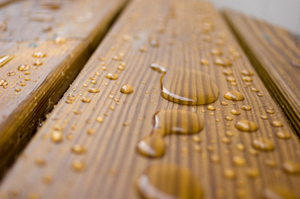 Special attention needs to be taken when staining/re-finishing/coating a hardwood deck. The hardwoods require a special stain that will penetrate the dense molecular structure and dry evenly. These exotic stains contain high quality oxide pigments and the three following oils: Tung oil, Lindseed OIl and refined Paraffin. Using a high quality brush to apply these stains and wipe excess will allow for the wood to remain brilliant. Preperaring hardwoods for transparent stains takes a little extra work. Finishes: Depending on the appearance you are looking for and the condition of the wood there are a number of options. Many of these finishes also come in Water-born and solvent based (oil) products. Clear – Gives crystal clear protection without color, and allows wood to gray naturally. Transparent – Offers maximum grain clarity with a hint of color; best for wood in excellent condition. By far the most popular finish. Semi-Transparent – Gives moderate hide to wood grain with subtle color; best for wood in fair to good condition. Solid Color – Maximum hide with an opaque finish; best for weathered wood or problem surfaces. We will talk more in future posts about Exterior staining products. We look forward to working with you!